The breast of the Red-tailed Hawk stood out in the early morning sun as it perched atop a pinion pine on the bluff above the road. It was the first bird for our segment of the Sandia Christmas Bird Count. While it was clear and sunny, the temperature as we started the count hovered around 15 degrees. I was glad that we could do most of our route from the car and kept thinking about those who were trekking the foothills. “Bluebirds,” Bonnie called from the back seat. We were driving slowly along the frontage road near the Zuzax exit off of I-40. The cobalt blue of the Western Bluebirds flashed as they flew from bush to bush. We also picked up our first Robin, a Northern Flicker and several House Finches. As we headed up Gutierrez Canyon, Rebecca stopped the car along side a juniper. “I hear a titmouse,” she said. And, then a Juniper Titmouse popped into view – the first of 16 we would see during the seven and a half hours. A little further on, we spotted a Townsend’s Solitaire and our first Hairy Woodpecker. “There’s a raptor on the power pole behind us,” Laura called through the two-way radio from the car behind us. It was a Cooper’s Hawk. The white tail feathers of Dark-eyed Juncos flashed as a small flock flushed from the bushes and flew to another shrub. Most these were the Oregon race. Juncos were everywhere along our route and we would end up counting 250 of them during the day – Gray-headed and Pink-sided, in addition to the majority of Oregons. As we started north from I-40 on Magic Valley Road, Rebecca pulled the car over on the shoulder. “There’s a Merlin on the top of that power pole,” she reported. She hopped out of the car to get a better look. When it flew off, she was able to see the baring on the tail. It was the only Merlin seen during the count. The terrain in this part of the route was flatter. 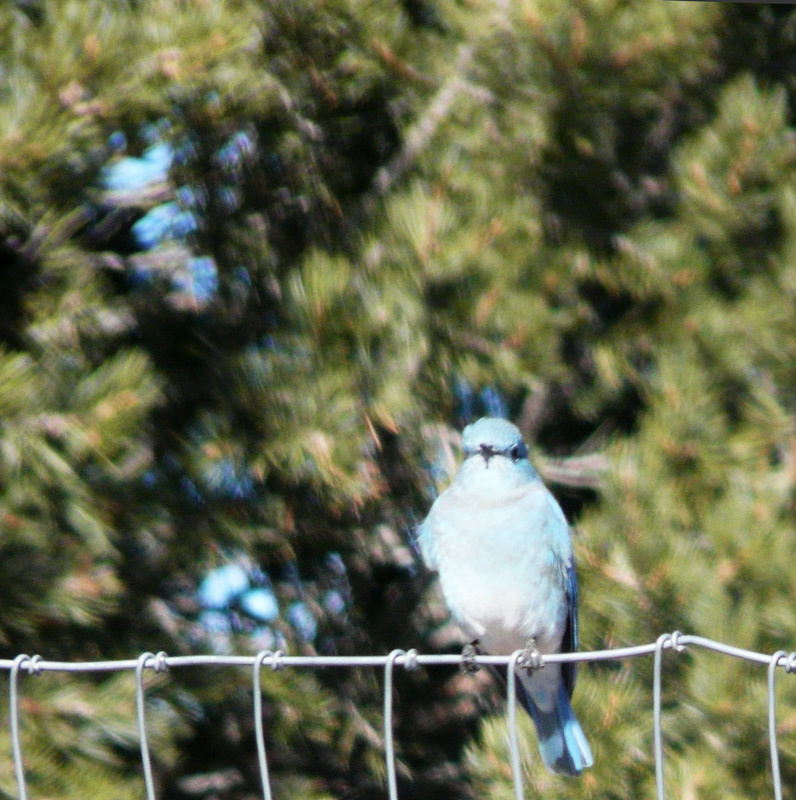 In the grassy areas of a new development we spotted our first Mountain Bluebirds. We would end up counting 77 of them during the day. Western Scrub Jays and Northern (red-shafted) Flickers seemed to be everywhere. Our count of 26 Northern Flickers was triple the number seen the past few years. As we headed through a rural neighborhood, we stopped and got out to check out a flock of birds in a New Mexico olive tree. At first we thought they were Cedar Waxwings. “I think I see white wing patches,” Rebecca commented. 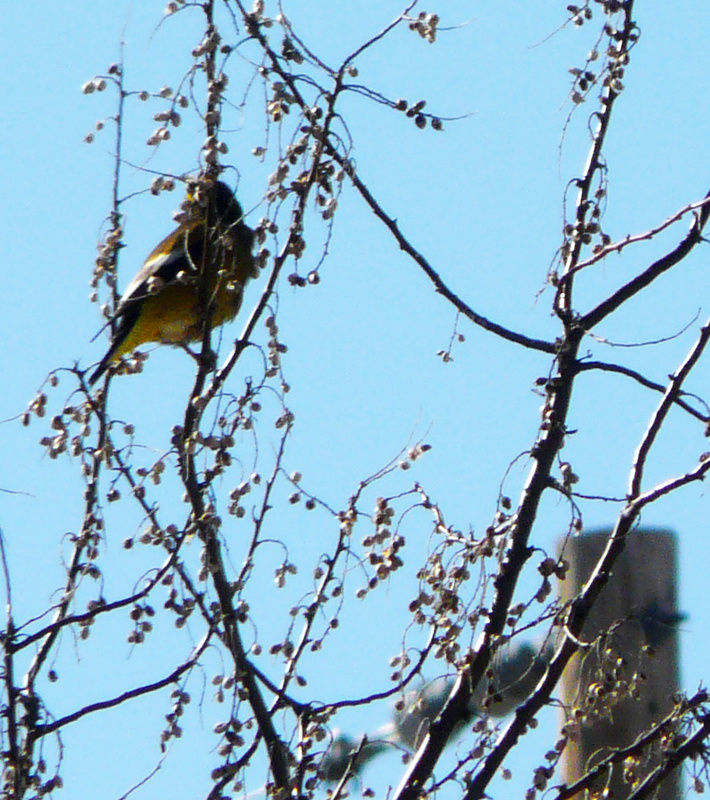 We inched closer – Evening Grosbeaks were feasting on the tiny berries. “I counted fifteen,” Amber stated, as I tried to capture a picture of one of them. By time we had finished our route about 3:30, we added American Kestrel, Canyon Towhee, American Crow, Common Raven and European Starling. The teams began drifting into Dion’s for the compilation party around 5:00. Most of the 40 participants made it. Andrew Rominger’s group was excited to report their Northern Goshawk sighting in Cedar Crest. Hal Wagnon’s group spotted the only Greater Roadrunner for the day while walking in Bear Canyon. Dustin Huntington had a Western Screech Owl on his property in Tablazon, and Raymond Van Buskirk, Robert Munro and Bill Talbot got both Northern Saw-whet and Great-horned Owls on their trek to the mountains at 4:30 a.m.
Nick Pederson’s group spotted the only Black-chinned Sparrow in the foothills. While Randy Floyd and Elaine Edmond saw all three species of Rosy Finch, they were unsuccessful in locating the American Three-toed Woodpecker or Red Crossbills when they snow-shoed along the trails at the Crest. As we munched our pizza we all were exuberant about our sightings for the day and 67 species for the count. “See you next December 26,” Rebecca called as we departed. It was a fun day, and you captured it accurately.